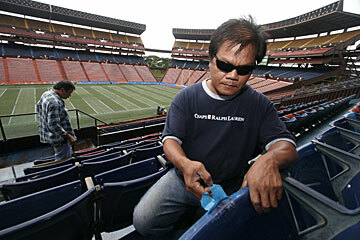 Aloha Stadium is in need of constant maintenance due to rust problems, water leakage and broken seats. Maintenance worker Jerry De Lacruz showed yesterday how cracks in the seats are repaired -- with tape -- since funds are scarce. The state must spend about $129 million over the next five years to fix Aloha Stadium or it will eventually become unsafe, state Comptroller Russ Saito said yesterday. "We have to fix it or at some point we are going to shut it down," Saito told the Stadium Authority. 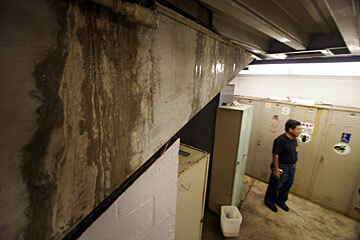 The problem is corrosion and the age of the facility, which was finished in 1975. The worst corrosion is in the roof, where it could affect the bolts that are holding the roof onto the structure -- unless something is done, Saito said. He said some parts of the roof should be replaced this year. The stadium is safe now, he emphasized. "It's not going to fall apart," he said, but it is continuing to deteriorate. Even if a new replacement stadium is built, the state still has to spend the money to fix Aloha Stadium because it would take an estimated seven to 10 years to complete a new facility, Saito said. A study done by the state and the engineering firm of Wiss Janney Elstner & Associates estimated it would cost between $225 million and $280 million to build a new 50,000-seat stadium. However, Saito said the estimate was based on 2005* construction costs and he believes the cost of a new stadium is closer to $440 million to $700 million. The costs of repairing Aloha Stadium is spread over five years so construction can take place during the time the stadium is not being used for football. The stadium study estimated it would take $100 million to fix the facility, but Saito said extending the construction schedule adds to the costs. Besides the roof, the grandstands and seats need to be repaired, the electrical system and other utilities need upgrading, the scoreboard needs to be replaced, lighting needs to be replaced, new elevators have to be added to allow access by the disabled, and more restrooms are needed, according to the study. Saito said he will be asking the Legislature for $25 million this year-- $13.5 million for planning and design and $11 million for repairs and for a new transformer and utility upgrades. The roof repairs are expected to cost about $11.9 million, and an additional $32 million is needed for the east stands in 2008 with $500,000; about $29 million for the west stands in 2009; and $30 million to repair the end zones in 2010. Other planning costs total $1.5 million. It cost less than $37 million to build Aloha Stadium. Water dripped yesterday from an Aloha Stadium locker room ceiling into a bucket next to Francis Garcia. The state spent $88 million on stadium repair and maintenance from 1989 to 1995, according to a 2004 House resolution. The National Football League also spent $1.3 million in 2003 to replace the artificial turf. The Stadium Authority is also being asked to decide whether to leave the stadium in a football configuration and not repair the machinery that allows the stands to be moved so baseball can be played at the stadium, a move that could shave $11 million off the repair costs. It would mean ILH baseball games and the state baseball tournament would have to be played elsewhere. Wade Okamura, the ILH baseball coordinator, said closing the stadium to baseball would be an inconvenience, but "there was baseball before it went to Aloha Stadium so I'm sure it can be done." Keith Amemiya of the Hawaii High School Athletic Association said that if the state baseball tournament has to move, the ideal solution would be to move to Les Murakami stadium at the University of Hawaii. But that would require the baseball team to schedule away games during the third week in May. The stadium will be in the baseball configuration for the upcoming U-2 concert. Scott Chan, the stadium events manager, said it allows the promoter to fit up to 10,000 more people into the stadium with better views of the stage. But, he said, concerts can still be held in the football configuration. Once the stadium is repaired, the state can also look at building luxury boxes that could add revenue, he said. It doesn't make sense to build luxury boxes now, Saito said. "Why would you put luxury boxes on top of a superstructure that is corroding?" » The estimates for the cost of building a new stadium are based on 2005 dollars. A Page A1 article Friday incorrectly said they were based on 1995 dollars.